Be the hero of the day with the Chad Valley Lights and Sounds Helicopter, a fantastic toy for stimulating inspirational roleplay. 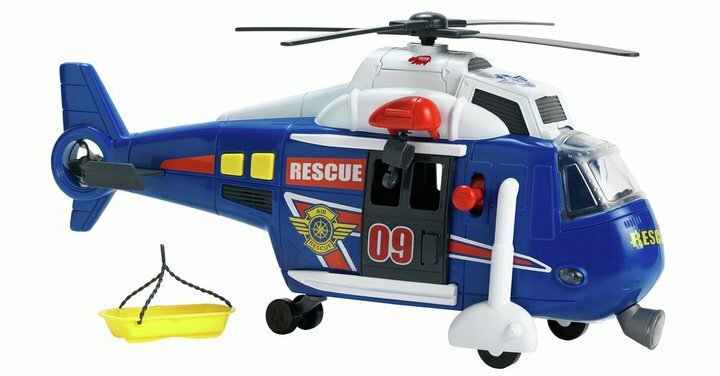 Come to the rescue of those in need with your very own rescue helicopter with life-like search light and authentic sound features. The 'copter has a battery operated rotating propeller and winch with hook to enable the lifting and lowering of the stretcher for those tricky rescues and an opening cockpit with sliding doors, which adds to the realism. (Size H17, W41, D17cm). Get money off with April 2019 free Argos voucher codes, see if there's a discount code for the Chad Valley Lights and Sounds Helicopter product.